Spending a day on the water will always been a day well spent. We love water sports, that’s why with the ever growing popularity of paddle boarding, we tried it and quickly were hooked. 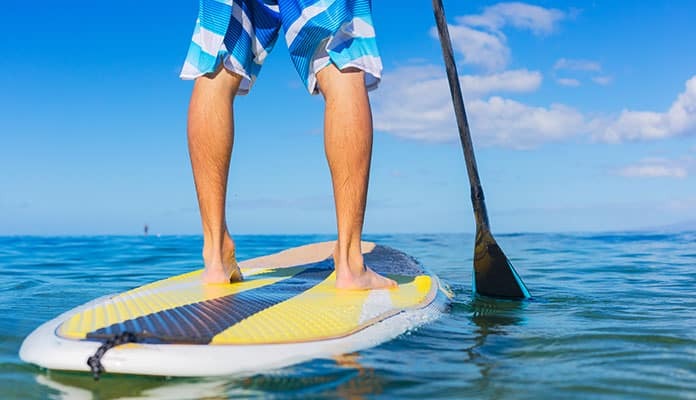 Investing in a SUP board costs money but for a fun and lasting hobby that happens to double as a killer full body workout, it is money well spent.. Standing on the board is sure to work your arms and legs while paddling through the water gives your upper body a workout. Whether you paddle for leisure or as a sport, have the best sup paddle will ensure that you get the most from your day at the lake. Almost every paddler will take a tumble in the water either intentionally or not. Nothing is better than being on the lake in the blazing sun and jumping into the cool refreshing water below. Do just that with the peace of mind that your paddle will stay afloat as you go. 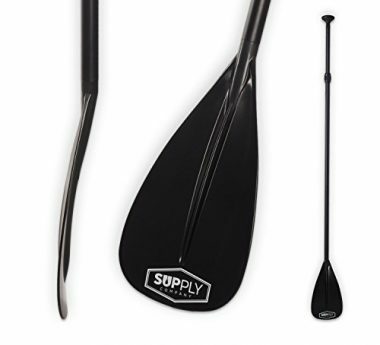 This extremely durable sup paddle is so good, Alloy has attached a full 1 year warranty to it. 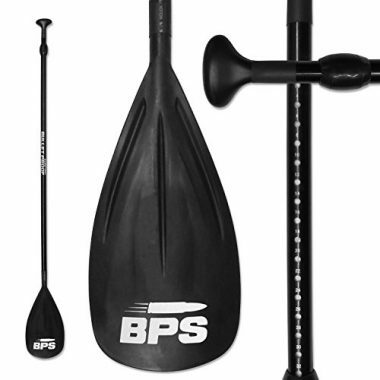 This high tech stand up paddle board paddle from BPS is made from the same carbon fiber material found on the world’s fastest supercars. This is an incredibly lightweight and high strength material that is ultra durable. The sup paddle can be extended up to 85” making it tall enough for people well over 6 feet tall. Making this paddle longer only involves undoing a latch and sliding the sup paddle to the height you want. Not only is this the best sup paddle, but the customer service of this company is top notch as well. They aim to respond to your emails within 12 hours no matter what day of the week it is. One of the best things to look for in a paddle is durability and rest assured that this paddle is just that. Don’t let its lightweight design fool you, this paddle is strong enough to pull you through the water and durable enough to take a beating when storing. The company selling this paddle guarantees its product for a whole 12 months. That may not seem impressive until they sell to rental shops which are notorious for hard use. This means that no matter how hard you are on this paddle it will still bounce back. This is another sup paddle that utilizes the benefits of carbon fiber and also uses a nylon material for the blade. Adjustable for anyone over 5 feet tall, this paddle only takes 20 seconds to set up. 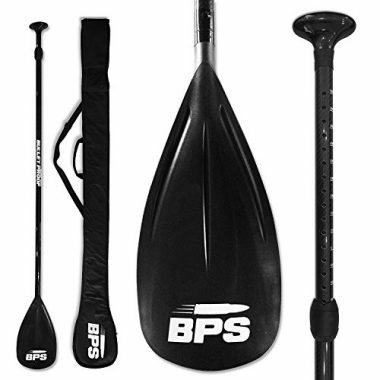 Not only does this package include the sup paddle, but also a handy 3 compartment foam padded paddle bag. This will ensure this already super durable set doesn’t get dinged in storage or transport. 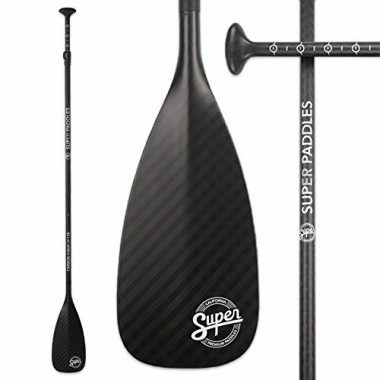 This is an excellent carbon fiber SUP paddle. No matter what you use this sup paddle for it will exceed your expectations. The high quality aluminum and nylon used to construct this paddle will ensure it will stand the test of time. That is why this company includes a 12 month replacement guarantee in the purchase. No matter if this is your first ever paddle, or you have years of experience this paddle will impress you. This sup paddle is a step up from the beginner sup paddles and will offer you everything you need in the water. 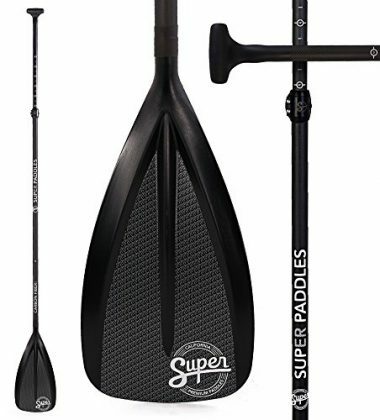 The materials are high-quality, especially at the price point, and the fact that you can adjust the length of the sup paddle makes it appealing. The rugged blade helps you to push through the water will a little effort, and will propel you faster than you would believe. The shaft also comes apart to allow easier storage and transportation. This is the blade for the beginner who wants to move up to the next level. It is also a blade which would be comfortable in the hands of any professional. This is one of the lightest sup paddles on our list. A lighter paddle means you can handle the sup paddle for longer and push it through the water easier, leaving you with more energy during and after your trip. The sup paddle also comes apart into three pieces to give you easier storage and transportation. We love that the paddle comes with its own bag, making traveling with this paddle a breeze. The sup paddle also floats, so you do not have to worry about losing it should it fall into the water. This is the best sup paddle that is great great for transit and storage. The sup paddle comes apart quickly and easily into two pieces, allowing you to store the paddle in the smallest vehicles or garages. 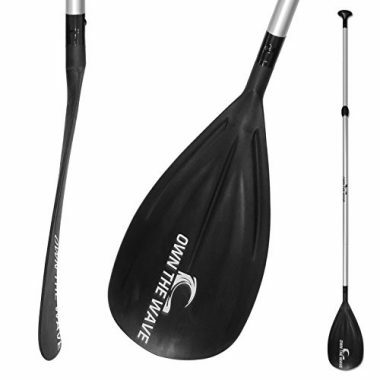 The paddle is also adjustable, allowing this paddle to be used by a variety of paddleboarders. 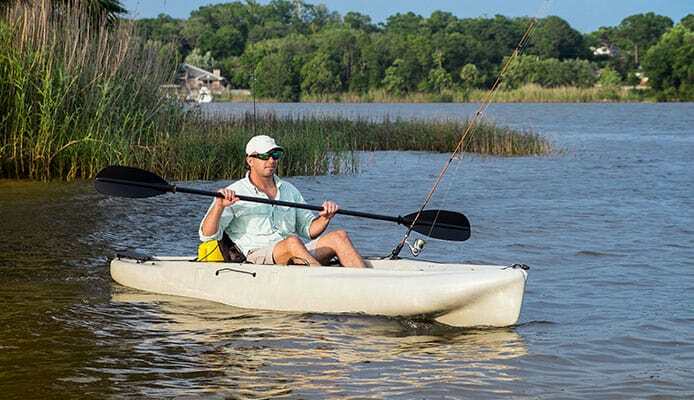 The handle has been ergonomically designed to give you the most comfort when you are paddling through the water, and the blade has been designed to give the most power while expending the least amount of energy. 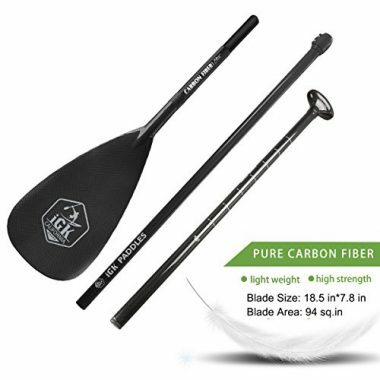 This sup paddle is extremely lightweight, but the lightness of the paddle has not compromised the strength and ease of use. The blade has also been modeled after a duck foot to give it extra power through the water. The carbon fiber shaft is extremely strong, allowing you to generate lots of power, and the blade is made from fiberglass, keeping it light and durable. This sup paddle is also adjustable, making it great for everyone, from beginners to more advanced users. This is an excellently crafted sup paddle, and the design on the blade really showcases the attention to detail. This is one of the strongest blades you will find and is the blade you will go to when you fall in love with paddleboarding. The blade has been laminated one layer at a time by an expert craftsman to give the strength and durability which could make this the last paddle you ever buy. The sup paddle is adjustable to give you the exact fit which you need. It also comes apart for easy storage. The carbon also adds strength to this paddle while helping to keep the paddle light. 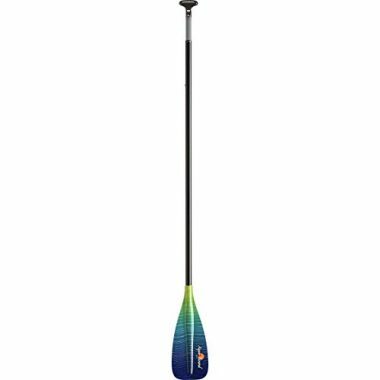 This is the best sup paddle which can be used by any level of paddleboarder, and one which will elevate your paddleboarding experience. You will quickly be the envy of your friends, that’s why we recommend opting for the best adjustable sup paddle so that you can find the size that works for you and them. A high quality paddle will include materials that are strong while being lightweight. Aluminum is one of these materials. It is lightweight while being strong enough to withstand the pressure and flex of propelling you forward. Carbon fiber and fiberglass also fit the bill of the best sup paddles. These are materials that are found on supercars meaning they are ultra high quality while weighing next to nothing. When looking for the best stand up paddle board paddle we recommend looking at the handle as well. It should fit comfortably in your hand as you will be replicating the same movement over and over. This will cause strain on your wrist and shoulder if the handle and angle of the sup paddle is not right for you. You have bought your paddleboard and are ready for the open water only to find that the package doesn’t come with a paddle. Fret not, we have compiled a list of the best SUP paddles. The length of your sup paddle depends on two things: your height, and the type of paddleboarding you are going to do. Generally, the taller you are, the longer your sup paddle will be. A short paddle gives you better control and acceleration, while a longer paddle gives you a better top-speed, saves your energy, and gives you a more upright paddling position. When you are choosing the best sup paddle, you want to aim for a paddle which is roughly 8-12 inches taller than you are. If you are in doubt about your paddle, then you can purchase an adjustable one, and then you can adjust the height of the paddle if you are finding it difficult to paddle. 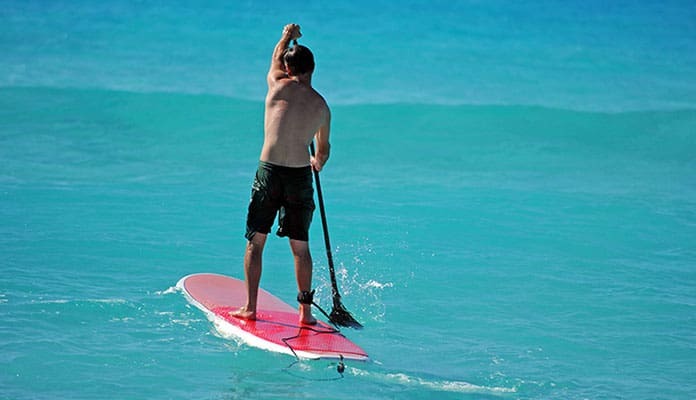 If you are using your paddle for surfing, then choose a paddle which is 0-7% taller than you. 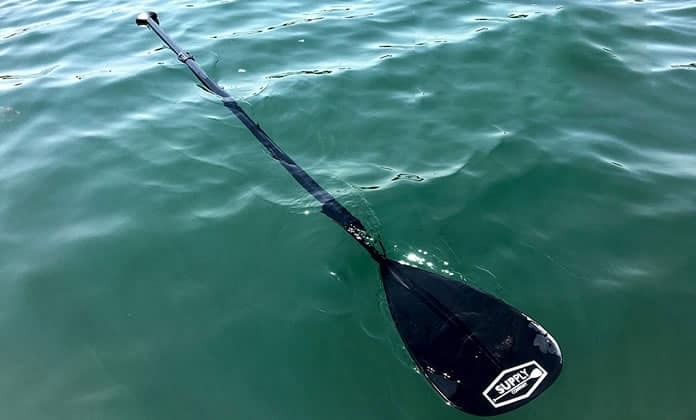 This paddle will take more energy to paddle, but you can get it in and out of the water quicker, making it a great size of a paddle for short bursts. If you are paddling recreationally, then you want a medium size paddle, so aim for 7-12% above your height. If you are racing your paddleboard, then you need to aim for a paddle which is 10-15% above your height. This paddle will be harder to get in and out of the water, but when you are up to speed, your top speed will be higher than a shorter paddle, and you will need less energy to maintain that top speed. When you are choosing your style of grip, there are not many things to think about over the comfort. A lot of this will come down to your own personal preference. Try out a few grips and find the one which feels most comfortable. At the top of the sup paddle, you will find either a ball-shape or a T-shape. Choose the one which feels most comfortable to you. You should also be looking at the material. You want a material which will give you a lot of grip. If your hands slip a lot, then they are going to get chafed, and blisters are going to appear. This can put a stop to any paddleboarding trips. As well as looking at the grip of the material, you should also be looking at the comfort of it. You want to find a material which is soft and comfortable. For some paddleboarding trips, you are going to be out on the water for a long time. You need to find a grip which you will be able to hold onto for hours at a time. Look for ergonomically-crafted grips with good hand positions. Your storage can be broken down into two main areas: transport and long-term. When you are carrying your paddle from your vehicle to the water, you want it to be light enough to carry for long distances. You are going to be carrying a lot of equipment, and the fewer trips to the water, the better. A lightweight sup paddle will be your new best friend. When you are putting your paddle into storage (and also when you are carrying your paddle), you want the paddle to be small. Some paddles are one-piece, so they cannot be broken down. Paddles are relatively small, so this may not be an issue, but if you have limited space, then you should look for a paddle which comes apart. Most multi-piece paddles come apart into three pieces, making them very easy to store. There are three main materials which are used in the blade and shaft of your paddle. Aluminum is one of the most common. This is an entry paddle material and one which is great for beginners. Aluminum is strong and sturdy while remaining lightweight and affordable. The affordability makes this choice one which allows you to try paddles before committing to a more expensive paddle. Carbon Fiber is the lightest and strongest of all the blade materials. They are also among the most expensive. Carbon fiber is often used by professional paddleboarders and racers. The weight of the paddle makes them good for endurance races, and the strength is good for generating a lot of speed at the beginning of the race. They are great for navigating rough waters. Fiberglass fits in between the other two materials. It is strong and light. The price is in the mid-range, making it a food step up from an aluminum paddle, but one which will not set you back as much as a carbon fiber one. It is lighter than aluminum and stronger, but not as strong and light as carbon fiber. There are different styles of blades which you will find at the bottom of the shaft. The type of blue you need will depend a lot on what type of paddleboarding you are going to do. The shape will determine how the blade moves through the water and will determine how much energy you will use pulling the blade through the water. The style of the blade depends on two key elements: the size and the shape. The size of the blade will determine the resistance through the water and the energy you expend. A larger blade will take more energy to pull through the water as the large blade will offer more resistance in the water. Medium blades will offer less resistance, and small blades will offer the least resistance. Small blades are easy to move through the water and are great for initial acceleration. A large blade will get you moving slowly, but when you are moving, you will move fast. For beginners, we recommend a smaller blade. A larger blade can be hard to handle when you are first learning how to paddleboard. A small blade will make it easy for you to move the paddle through the water and will let you focus on your technique instead of building your strength. The same goes for anyone who is lacking strength, mobility, or is not in great physical shape. A small blade will get you moving without needing to expend a lot of energy. The shape will also affect how quickly your board moves through the water, and it will also affect the maneuverability of your board. The profile of a blade goes from rounded to square, and each shape offers you something different. A square blade gives you more power. They will need more energy to move you through the water, but they will give you the best speed. Rounded blades move easier through the water which makes them better for moving through turbulent water, and water with waves. There are paddle blades which are somewhere in the middle, giving you a slightly rounded shape. These are best used for endurance races and will give you the benefits of both. When you are looking at the shape of the blade, you also need to look at the profile of the blade when you look at it from the end. You will have two choices: a flat blade and a dihedral blade. As the name would suggest, a flat blade is flat. Flat blades generate more power through the water, and they allow you to turn quicker. The quick turn in the water makes a flat blade a great choice for a surfer. A dihedral blade is a better option for beginners as it is easier to use. The dihedral shape is slightly more curved and comes up to a point in the middle. The dihedral blades are smoother through the water. The unique shape, when compared to a flat blade, make them move through the water smoother. The blade can wobble slightly if the stroke is not straight, so we would recommend practicing with the blade, and not giving up if the blade does flutter. When you have mastered the stroke, you will find it very easy to paddle with this shape of a blade. All paddles have an angled blade. The shaft will be straight, but when you get to the blade, there will be an angle in it. Around 10% will be the most common angle, but it can be as little as 6% and as big as 12%. The angle you choose will be a personal preference, and you should try out some of the best sup paddles to see which angle feels more comfortable to you. Q: Why Are Sup Paddles Angled? A: SUP paddles are angled for two reasons. The first is to allow you to move the blade through the water more easily. If the blade was parallel to the shaft, then it would take more power to push the blade through the water, and you would expend more energy. The angle in the blade makes it easier to move the sup paddle through the water, meaning that you need less force to move the blade. This is especially critical when you are standing up on your board as you do not want to be pushing against the water too much. If you are using too much force on your board, then you run the risk of losing your balance and falling in (make sure that you are always wearing a life jacket, just in case you do fall in). The second reason for the angled blade is to prevent water from being lifted when you are pulling the blade through the water. If you are lifting water behind you, then you are using energy to move that water. When the paddle is out of the water, there is no need for you to be using force to move water. With no water being lifted, you are using less energy, and generating more power. With the combination of the two reasons, you can paddle for longer and paddle faster. Q: How To Size Sup Paddles? A: When you are choosing the type of paddle you need, you need to think about what you want in the water. A short paddle will generate acceleration and get you moving quickly, while a long paddle will get you moving slowly, but will have a higher top speed. A larger paddle will take more energy, while a smaller paddle will take less, but a large paddle will keep you more upright, while a smaller paddle will not. The general rule is that a paddle should be taller than you. About 8 inches taller is the standard. After using a paddle for a while, you may want to change your stance. We would recommend a longer paddle for beginners. When you are starting out with paddleboarding, you are not going to be focused on getting moving quickly, and with a long paddle, you can take your time. You can be slow and steady with a long paddle, but when you do get moving, you will get moving fast. If you are looking for a paddle for surfing, then you will need a shorter paddle. When you are surfing, you need to get somewhere fast and need to turn quickly. A shorter paddle is better for small bursts of speed and quick turns. Take the time to use a variety of paddles and find the one which feels most comfortable. Q: Do Sup Paddles Float? A: Most of the modern paddles will float, and it is our recommendation that you always find a paddle which floats. It is almost certain that at some point you will drop your paddle in the water. When this happens, you want to be able to get it back quickly. You do not want to be stranded or have to buy a new paddle. If you are worried about your paddle, then you can get a paddle leash so that the paddle is always connected to your wrist or ankle. Q: How To Use Sup Paddles? A: If you hold a paddle correctly, then you are going to be able to paddle easily through the water, and move faster. A correctly held paddle will also save you energy when you are paddling through the water. SUP paddles are longer than a paddle which you would use for a water sport such as kayaking and are held in a different way because of this. They are also usually adjustable so you can find the perfect fit for you. SUP paddles are longer as you need that length for the blade of the paddle to reach the water. When you are holding your paddle, you will have one hand on the top of your paddle. You will then have the other hand lower down your paddle. If you stand with the paddle in the water, and one hand on the top of the paddle, take note of the angle of your arm and use the same angle for your other arm lower down the paddle. When you are holding your paddle, the blade should also be angled forward. Q: How Long Are Sup Paddles? A: SUP paddles come in all lengths and sizes. There is no one length of paddle, and you will find paddles for the smallest kids and the tallest adults. You will also find adjustable paddles too. The key when you are looking for a paddle is to look for one which is 8-10 inches taller than you are. Don’t be stuck on the lake without sup paddle. An overwhelming amount of sup paddle reviews agree that having a lightweight, 3 piece adjustable paddle is the three key features to look for. Especially for those who love to take the best sup paddles on long distance paddles or who like to race, finding the best sup paddle for your trip will prove invaluable. Love paddle boarding? Have one of the best sup paddles on our list? Let us know how you like it in the comment section below.